If I weren't reasonably placid, I don't think I could cope with this sort of Wriphe. If you had four Alex Trebek autographs and I gave you nine more, how many would you have? Earlier today I had to run some errands. Despite the cool weather, I decided to take the Jeep because it hadn't been out of the garage in a few weeks. Turns out, that was a bad idea. The Jeep had been drydocked because its left turn signal was out. I had tried replacing the bulb that wasn't coming on, the left fender light, but that hadn't solved the problem. Most people would probably have taken their car to the mechanic. Not Walter. I decided to solve the problem myself. The contacts were corroded in the 20-year-old bulb fixture, so I figured that was the likely problem. I bought a replacement part, pulled the old fixture, reconnected the wiring, and put it all back together. It still didn't flash for turns, but it did come on for hazards. So I replaced the flasher relay. That didn't fix it either. It was at this point that I realized that one of the parking lights wasn't working correctly. It blinked with the hazards, but stayed off when the headlights were on. Swapping the two parking-light bulbs caused the left flasher to work and the right to fail. Voila! The whole problem was indeed a bad bulb, just not the one I originally suspected. As I said, after all that, I finally took the Jeep out on the street. It felt great to be driving it again. I turned on the right blinker as I pulled up to a right turn . . . and I got rear ended. The good news is that the rear lights were indeed working. The lady who hit me just wasn't paying enough attention. 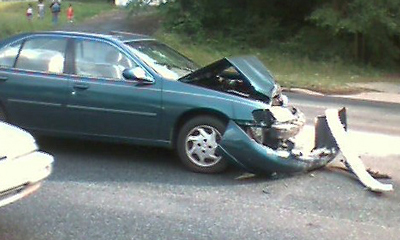 It was a minor fender bender that will cost about $70 to fix. (Bulbs and rewiring the front end had cost $80.) I gave thanks that it hadn't been worse, and went about my business. 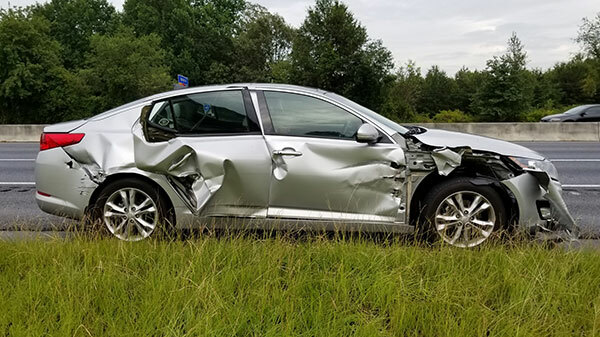 On the way home, I hit a deer. For the record, I did get the message. This just isn't the year for me and automobiles. The Jeep is going to stay safely in the garage until 2018. Ouch, sorry man. 2018 should be a great year! Well, it can't be any worse, right? If you had four dogs and I gave you seven more, how many would you have? For reference, this was the "other guy." Like I said, not a scratch. Oh dude...what the heck happened? Did he lane change into you? Nope. I lane changed into him. I have the $75 ticket to prove it. If you had ten traffic tickets and I took away two, how many would you have? Afterwards, if I gave you two more traffic tickets, how many would you end up with? I'd say "you should see the other guy," but his truck didn't take a scratch. Some people are lucky that way. If you had ten pointless rants and I took away five, how many would you have? Afterwards, if I gave you two more pointless rants, how many would you end up with? In a recent commercial, Cadillac brags about how clever their engineers are about considering the impact of a raindrop on a windshield at 190 MPH. Rather than marvel at the ability of Cadillac's engineers, this made me wonder why the hell Cadillac would plan to build a car that went 190 MPH in the first place. Cadillac is advertising their $70,000 CTS-V as the "world's fastest production sedan." I ask you, who the hell needs a sedan of any sort capable of 100 MPH, much less 190 MPH? Should you find a place to avoid any potential traffic, no public road in the United States of America even has a speed limit greater than 80 MPH. That's less than half of Cadillac's advertised top speed -- HALF! Cadillac is advertising a vehicle to the general public that cannot be legally utilized in any public space. And this from a company still 27% owned by the American public. 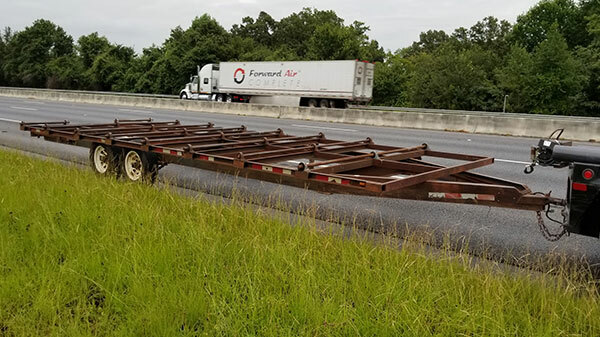 To put this ridiculous waste of a power in perspective, an average tractor-trailer has a 500 horsepower motor. The Cadillac CTS-V advertises 556 horsepower. Why does the Cadillac need that much power? To accelerate from 0-60 in 3.9 seconds of course. Numbers like that make this a very valuable car for spies in action movies, but not so much for the real world. When was the last time that anyone needed a 4-door car that could peel out of a parking lot like a jet fighter? Someone tell the kids to hold on back there. Since Cadillac is already recklessly marketing their reckless car to rich people who like to drive too fast, it's my advice to you, any policeman who might be reading this, to ticket the hell out of anyone you see driving a Cadillac CST-V. Odds are that if he bought this car he intends to speed in it, and he certainly has money to waste. I am more concerned with the Windows Cloud commercial that shows the mom trying to take a good picture of her family and she basically photoshops a good pic and says "Windows gives me the family that mother nature never could". Better is the Lyrica ad where the middle-aged woman tells the audience that she has just discovered what nerves are. Am I really supposed to take drug advice from someone who doesn't know what nerves are? If you had six DC Comics and I took away six, how many would you have? Afterwards, if I gave you four more DC Comics, how many would you end up with? What hates cars more than Superman, the Man of Steel? Superman, the Truck of Monster! Surely, you've seen this before. Action Comics #1 is the godfather of the modern American super hero comic book. Though not the first comic to feature all-new content, characters, or action, it is the first appearance of a super powered hero (Superman, of course). A lot has been written about this issue and it's significance to the American psyche. However, one thing bugs me about most critical analysis: the make of the car. Most simply reference the object of Superman's wrath a "car" or "sedan." Come now, we can do better than that, can't we? How can we, Americans, with our insatiable lust for the automobile and the goods and evils that accompany it, continue to ignore this perfect marriage between super heroic violence and the American Dream-mobile? The car is clearly a mid-1930s four-door touring sedan. They sold spectacularly well, even during the Depression. Every manufacturer made at least one. So which one is it? First of all, this car is not a Studebaker. Author Chris Knowles and Illustrator Mark Engblom both make such claims in some otherwise insightful online commentary. However, there's one glaring error with those claims: the car doesn't look much like a Studebaker. The 1934-35 Studebaker Land Cruiser (whose body styling was introduced to the public at the 1933 Chicago World's Fair via a spectacular 28-feet tall scale model) doesn't have suicide doors. 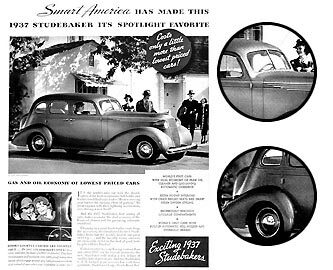 By 1936, Studebaker's touring sedans had split-windshields, as became the popular choice of most manufacturers within a year. So if it's not a Studebaker, what can we see about this car that may tell us which one it was specifically? 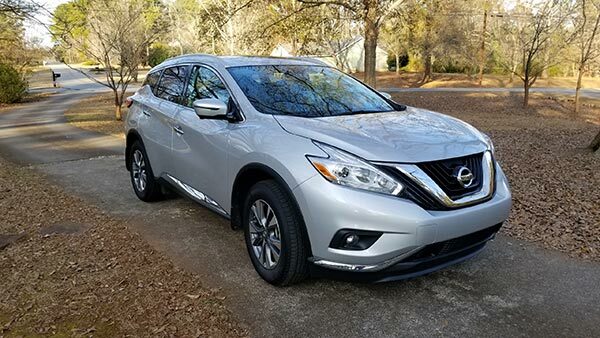 Three things are worth noting: the single-pane windshield with it's curved bottom edges; the angled, horizontally-ribbed grill; and the curve of the detailing above the rear fender. Like Studebaker, Oldsmobile was using split windshields by 1936. Chevrolet's sedans were very square with straight line detailing. Ford marketed Fordor Model 48 sedans in 1935 and 1936, though again, their body detailing doesn't match the car shown. Not surprisingly, most of the manufacturers making touring sedans (Buick, Ford, Hudson, LaSalle, Packard, Pontiac) fail to meet at least one of the criteria established. 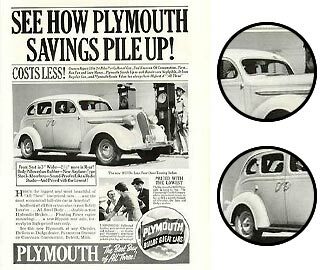 Yet the 1937 Chrysler sedans appear to be good matches. Chrysler produced nearly identical touring sedans with the Chrysler, Dodge, DeSoto, and Plymouth nameplates. These models have minor superficial differences, though their general features are all a great match to Superman's sedan. 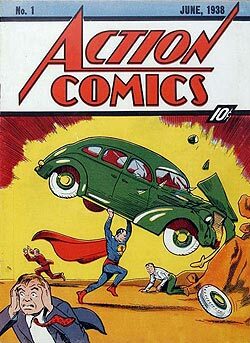 The car that appears between the pages of Action Comics #1 appears to have different front grills in different panels. It is possible that Shuster used different cars for different panels, depending on which angle he was drawing. Maybe he even had a brochure featuring many of Chryslers sedans. (Chrysler was not shy about the cross promotion.) 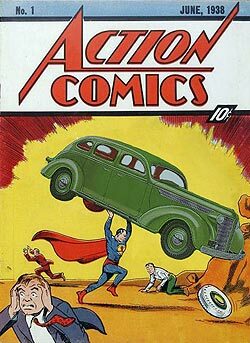 However, after comparison, the 1937 DeSoto touring sedan is perhaps the best match for the grill depicted on the car in Superman's hands on the cover. It's worth noting that the DeSoto sedan differs from the 1937 Dodge D5 sedan only slightly in the grill and via the bonnet side-vent panels. Hastily-drawn line-art of the two would be practically indistinguishable. 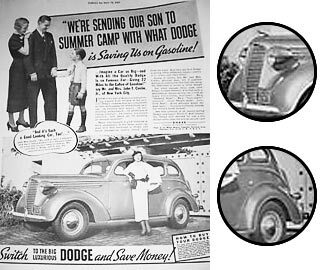 Since Dodge was already advertising "toughness" in 1938 (and had already adopted it's now-familiar ram hood ornament), it's quite possible that the car Superman is destroying is intended to be a Dodge. What better way to demonstrate the power of a Man of Steel than to have him destroy something Ram Tough? So now you know. In any event, Superman hates Chrysler. And when Superman hates you, you don't stay in business. If you had six lines of code and I took away four, how many would you have? If you had three pauses that refresh and I gave you four more, how many would you have? Afterwards, if I gave you four more pauses that refresh, how many would you end up with? If you had two footballs and I gave you five more, how many would you have? 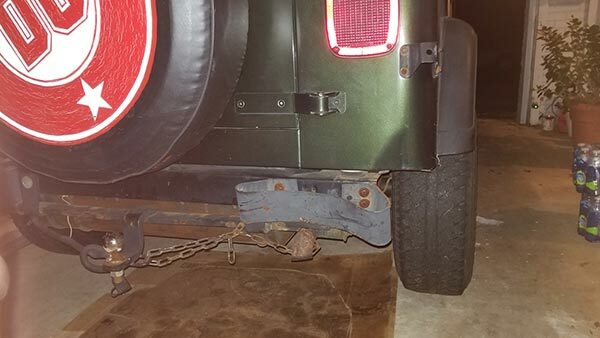 My Jeep suffered only the destruction of it's bumperettes (yes, that's a technical term: it's those small D-shaped steel loops on the rear bumper) and the driver's seat now won't maintain an upright position. Worst of all? My Batman tire cover now has a tear in it. It will have to be replaced. Last month I was complaining about mandatory seat-belt laws. It just so happens that I was wearing one when I got rear-ended. Go figure. You may have won this round, "The Man," but this war isn't over yet! If you had three amusement park rides and I gave you eight more, how many would you have? Afterwards, if I gave you nine more amusement park rides, how many would you end up with?